From November 28 to December 1, the best form of golfing is expected at the Damang Golf Club in the Western Region. It is the fifth edition of the Gold Fields Professional Golf Association (PGA) competition; which coincides with the 25th milestone of Gold Fields. And to make the 72 hole event an epoch-making one, the organizers have extended invitation to the Otumfuo, Youth and Sports Minister, Isaac Asiamah and other high profile dignitaries. 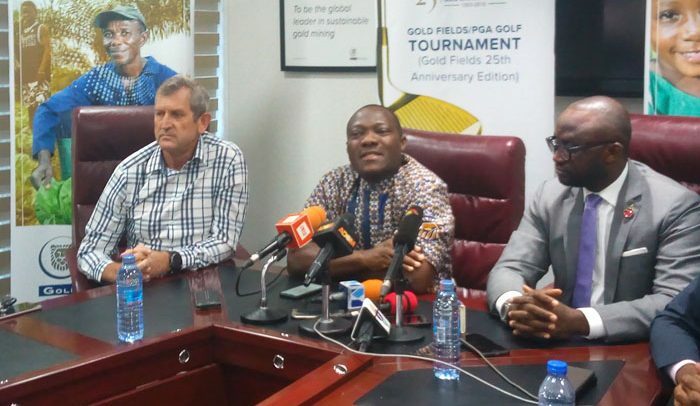 In a media briefing to roll out the programme for the competition, Alfred Baku, Head of West Africa Region and Executive Vice President at Gold Fields Ltd., himself a golfer, announced that ¢35,000, a trophy and other souvenirs are at stake for the ultimate winner. He expressed the wish that the sport would be engrafted into schools programmes. To him, raising a female pro golfer remains one of his outfit’s dream. The competition has seen improvement in the results, having recorded a 12, 2, 7 and 6 under respectively in the last four editions. PGA president, Tony Mintah, pointed out that plans were in place to roll out a great tournament.